You stand in scorching sunlight to get the perfect sun-kissed picture. While you are at it, your skin is safe and protected – thanks to your favorite sunscreen that you have been using for ages. But what about your hair? Ever wondered what happens to your poor tresses in the harsh sunlight? Just the way your skin requires sun protection, your hair needs it too. UV rays damage your hair cuticles, turning them rough and brittle. But, hey! It’s not too late. 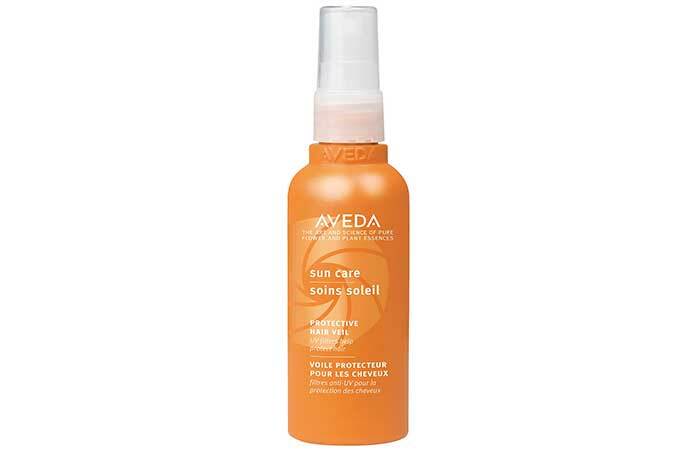 Just carry a sun protection hairspray on your next trip to the beach. 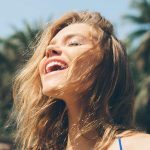 Want to know which brand offers the best SPF hairsprays? Check out the list below! This new sun care hairspray is taking the world by storm with its oil-spray formula. It is formulated with organic Indonesian Nyamplung oil that protects the skin and hair from the drying effects of the sun. Its exotic blend of senna extracts, plane tree extracts, and aloe vera defends your hair from UV damage. It also contains extracts of gold cob and sycamore to promote healthy and nourished hair. A quick spray can last all day. 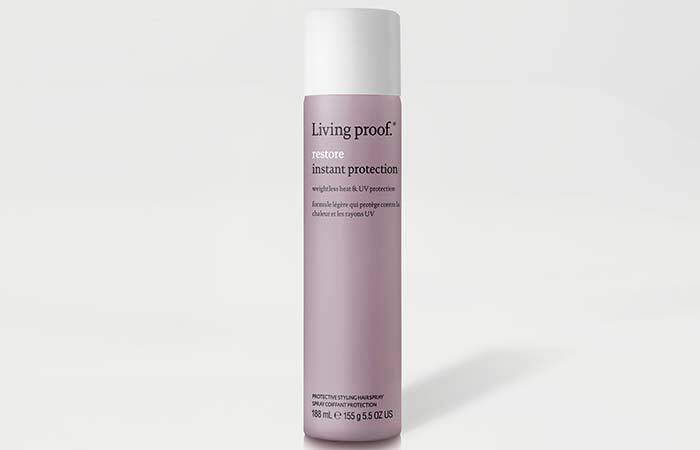 This lightweight UV defense hairspray forms an invisible layer on your hair to protect it from sun exposure. It contains UVA and UVB filters derived from wintergreen and cinnamon bark oils that protect your hair from the drying effects of the sun. This hairspray is made with sunflower seed oil, coconut oil, palm oil, shea butter, and other natural plant extracts, and it protects your hair and scalp from the damaging UV rays. It also contains ylang-ylang, neroli, and other flower essences that impart invigorating fragrance to your hair. 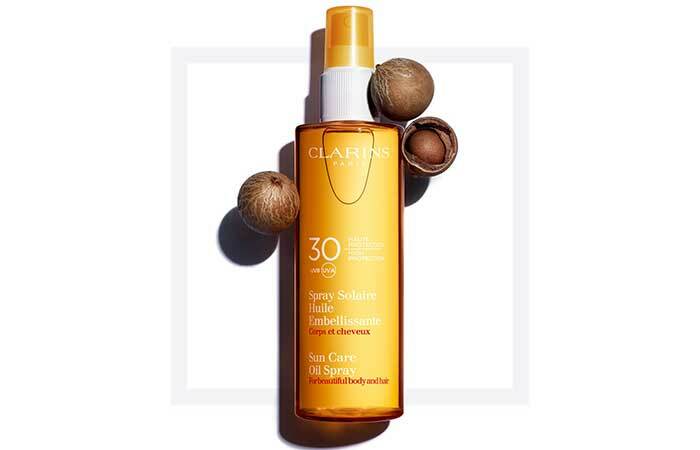 Protect your hair from the unpleasant UV rays with this nourishing summer oil. Made with a blend of grapefruit, apricot, jasmine, and coconut, this hairspray conditions your hair and prevents it from drying out. It is formulated with KPF 90 (Keratin Protection Factor) that provides your hair with UV protection, castor oil that replenishes and nourishes your hair, and sesame oil that hydrates your hair. 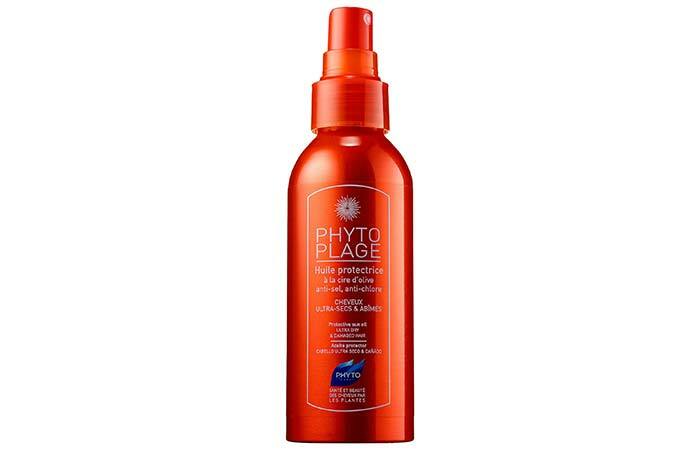 This lightweight sun protective spray protects your hair and its color from UV damage. It forms an invisible layer of protection on the surface of your hair cuticle against dehydrating UV rays. It protects your hair while preserving its radiance. It contains a blend of botanical ingredients like calendula, olive oil, castor oil, and vitamin E that provide softness, shine, and hydration. This nourishing hairspray contains omega-6 fatty acids that soothe your scalp and improve blood circulation. 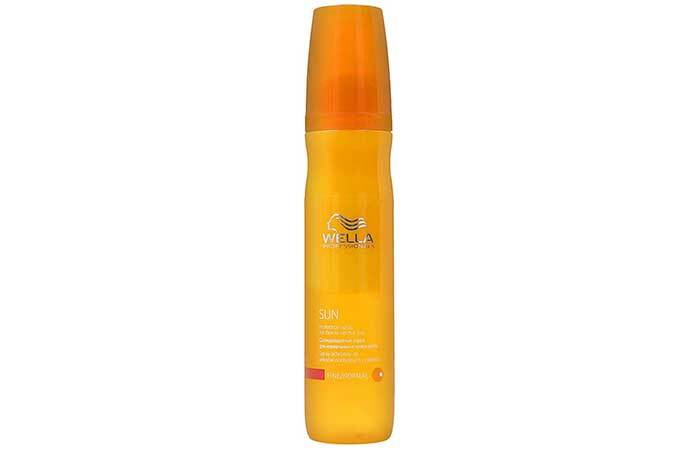 Wella Sun Protection Spray contains a vitamin complex that nourishes and smoothens your hair. This high-performance hair protector can be used before and during sun exposure. It keeps your hair hydrated and moisturized. It conditions your hair and seals the hair cuticles to fight frizz and split ends. This lightweight formula provides a glossy finish and improves your hair texture. Philip Kingsley’s Sun Shield hairspray is ideal for a beach vacation. It prevents damage from UV rays, chlorine, and salt water. This sun protector hairspray is infused with conditioning Hydro Elastin and sunflower seed extract that helps control frizz and breakage. This formula nourishes and smoothens hair and prevents your hair color from fading. It repairs damaged hair cuticles and leaves your hair looking soft and silky. This lightweight hairspray adds shine to your hair while protecting it against heat and UV damage. It is formulated with healthy hair molecules and a conditioning agent that moisturizes and hydrates your hair. It is made of a special UV absorber complex that creates a layer over your strands for UV and heat protection for 24 hours. This luxurious hairspray contains UV filters that protect your hair from sun damage. It is infused with sunflower seed oil that provides nourishment, shine, and protection to your hair, leaving it silky, soft, and hydrated. It minimizes dehydration and prevents color fading while adding radiant shine to your locks. This fast drying hairspray is featherlight and perfect for daily use. 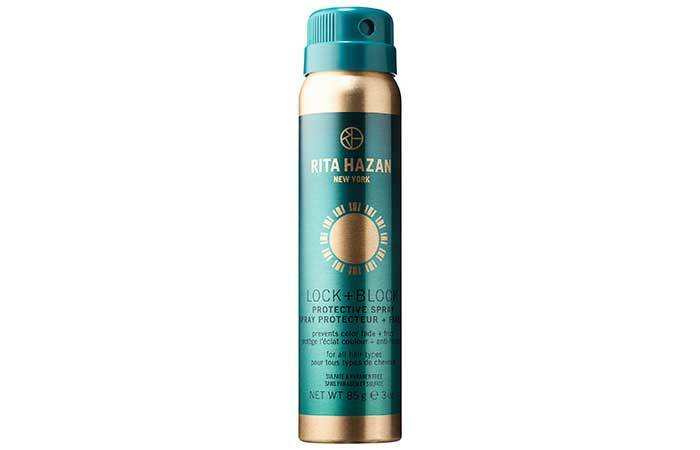 This sun shield oil spray protects your hair from sun damage and salt water. It contains essential minerals and active proteins that protect your hair and restore its natural radiance. It forms a moisture-locking barrier around each strand to prevent your hair from drying out. It repairs damaged tresses and leaves your hair feeling silky, soft, and shiny. It is formulated with SPF 8. This weightless hairspray blocks out humidity and UV rays and protects your hair color from fading. It contains nourishing properties that provide antioxidants to your hair, leaving you with silky, smooth, and healthy-looking hair. It claims to fight frizz and repair damaged hair cuticles. This nourishing hairspray coats each strand with vitamins E and A to give you damage-free hair. Those were our top picks for sun protection hairsprays available in the market right now. Grab your favorite product and let us know about your experience in the comments section below! Sun exposure makes your hair dull, lifeless and weak due to the harmful UV rays. No need to worry. Here are some homemade sunscreen for hair recipes that work wonders. Do you have dry, damaged hair? Do you use hot styling tools frequently? You must have skipped one crucial step all this while – using thermal protectant hairsprays. Exposing your strands to high temperatures without a protective layer means destroying the vital proteins in your hair.